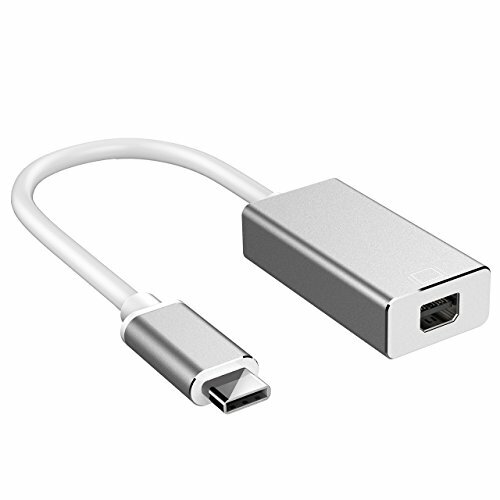 Wide Applicability: This Type C to mini DisplayPort adapter can be used at home for watching movies, in the office for having a meeting, in the class for doing a teaching presentation. Extend your computer to a second large screen. Aluminium Frosted Shell: With aluminium frosted finish, our adapter is heat- eliminated, heavy-duty, and anti-scratch, guaranteeing a long lifespan. Reversible Plugging: Type C port supports reversible plugging, and it will make connection more convenient. PVC Jacket & Copper Core: Covered by PVC plastic, the cable is flexible and durable for daily use; built-in premium copper core ensures stable signal transmission without flicker, shaking, or ghosting. Mini DisplayPort is NOT Thunderbolt . Do not support bi-directional signal transmission, it transmits signal from Type C port to mini Display Port only. 4K video resolution requires a 4K capable computer video source, DP cable and output display. Connect the Type C port to your computer or C-port center rather than another adapter. ① This Type C to mini DisplayPort adapter for Macbook2015, Macbook2016, Macbook2017, Macbook Pro, Chrome Book, Mate book, XPS13，XPS15. Type C to Mini DP with One-Way Transmission: Transfer signals from devices with Type C port to configurations equipped with mini DisplayPort connector; it is not a bi-directional adapter and transmits signal from Type C port to mini DisplayPort only; an additional mini DP cable is required (old Separately). 4K UHD Resolution: Supports max video resolution up to 3840x2160@60Hz (4K), backward compatible with 1080P, 720P and 480P; supports DisplayPort1.2, and the bandwidth speed of signal transmission can reach up to 10.8Gb/S. Wide Compatibility: Compatible with Macbook2015, Macbook2016，Macbook2017，MacBook Pro, Chrome Book, Mate Book, Pavilion x2, XPS13，XPS15, YOGA 5 PRO，XIAOXIN AIR 12 and so on. Easy Installation: No other external power supply or drive is needed, and it supports plug and play. Just hook up the Type C port to your computer or laptop, and connect the mini DisplayPort to your HDTV, monitor or projector with ease. Video and Audio Output: Coming with audio graphic card, it makes video and audio synchronously output possible, which will take you to a glorious video and sound feast on a larger screen. Warranty: 45 days money-back and 12-month, worry-free Guarantee!